As empathy is a part of the physical universe, it naturally has an evil twin. In my case, my empathy has helped me to master impressions and create performances, as well as paintings, illustrations, portraits, cartoons, sculptures etc. Why empathy? Well, if you can BE something, you can communicate about it; that’s art. To fully become aware of something, even something as banal as a bowl of lemons, you have to be willing to BE that bowl of lemons. That’s a form of empathy-the ability to understand and share the feelings of someone or some thing. The opposite of empathy, (call it non-empathy) results in generalizations, mis-duplications, parodies… lies of one form or another. The press is proficient at this– pretending great empathy, they mischaracterize as a matter of course. So, being able to view a subject, observe it fully, and communicate it through some expressive medium always involves empathy. It’s not just empathy towards how that subject feels and how the artist feels about it, but also empathy about how the viewer or audience will eventually receive it. Empathy only gets to be a burden if one can’t shut it off. This can cause one to stray off the path, if indeed you have one. See, my wife and I watched a wonderful documentary, WYETH, about American painter Andrew Wyeth. 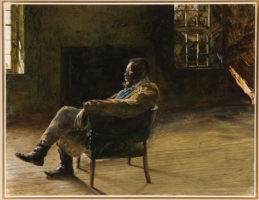 Andrew Wyeth was raised in an illustrious painting family, his father was the famous painter/illustrator N.C. Wyeth. He was a major celebrity in an age when book and magazine illustration by painters was in it’s heyday, just as photography was beginning to usurp their monopoly on mass media. If Francis Ford Coppola had been an oil painter, he might have had a little empire like N.C. Wyeth. Young Andrew was raised on sprawling Pennsylvania farmland which had an enormous art studio on it filled with the art materials, costumes, props and weapons that his dad used to create his memorable book covers for Treasure Island and other classics. Man! How much fun was it to grow up like that? Andrew took a slightly different path from his successful father’s which, to quote Robert Frost’s poem, “made all the difference.” He eschewed illustration in favor of a unique brand of depiction that challenged viewers without spelling everything out for them. Fine art, as opposed to illustration. It’s virtually impossible to glance at an Andrew Wyeth painting and not become instantly ensnared. Luckily, any time spent examining a Wyeth will yield incredible dividends–there’s a abundance there to enjoy, marvel and wonder at. So, what could be bad about that? Andrew Wyeth practiced extraordinary artistic empathy, toward a dead deer lying in a field, to a leaf trapped on the surface of a frozen pond, to an old, hardscrabble New Englander posing regally in his German WWI helmet. Wyeth could BE all these things, and with the technical expertise which he had practiced daily since boyhood, he could allow viewers to BE them, too. After watching WYETH, now all I want is to move to Pennsylvania, buy a drafty old farmhouse and start painting using egg tempera. I want to find some craggy, unattractive neighbors and wander into their kitchens, doing surreptitious sketches which I then take back to my studio and paint with unflinching honesty. I want nothing better than to wander the hills and forests and coastlines of Maine, seeking out harshly lit landscapes with ghostly, wind-scoured barns and farmhouses, and paint pictures with the shadows of scudding birds tattooing their exteriors. I want to BE Andrew Wyeth. This is how I used to feel a lot when I was in my 20’s– easily thrown off onto a new course. One day I’d be interested in being a street performer/activist, the next, a stage actor, the next, a cartoonist… I mean, literally every day a bold new idea of “what I wanna do,” arrived at through empathy. That’s actually not a bad attitude to have when you’re 20. At this stage of my life, I have to acknowledge that my path, tenuous as it may seem, is fairly established and is uniquely mine; dramatic shifts are to be avoided, particularly when that shift is going to sooner or later reveal itself as folly. Nobody gets to be Andrew Wyeth but Andrew Wyeth. Even he gave it up eventually. I’m me, and that’s what I’m going to try and hunker down and deliver on for the rest of my turns-at-bat. Empathy, my old friend, laughs at me the while. The truth is, we can all be anything we want, and at any age. It’s just a choice. But like Andrew Wyeth’s life shows, being “all in” is very powerful. The time seems ripe for all of us to be “all in” on who we are and what we do. Do you ever get tempted to chuck it all and join some “circus” or another?